or what size cake you will need for 15 kids at a birthday party? Well here’s a handy little guide! 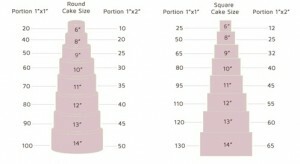 This is just a guide to help you decide what sized cake you will need for your special event. 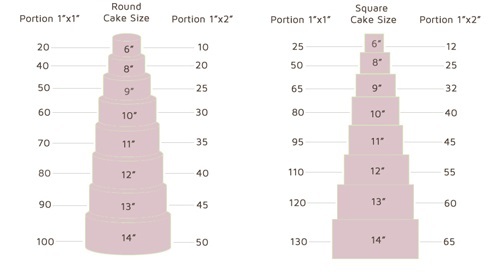 1″x 1″ portions are usually for weddings and the 1″x 2″ portions are for other celebrations, however it just depends on how much cake you want people to have!! Giant cupcakes and larger cakes are supplied with a board and a box. You are welcome to collect your cake or delivery can be arranged for a small charge. Weddings will incur a set up cost which will be shown in the quoted price. All cake orders require a non refundable 50% deposit. The date will be held for 7 days until a deposit is paid. Your order is not confirmed until I have received your deposit.